With The Frame, Samsung is targeting a very niche segment of the audience. But to that audience, this may be the only television worth buying. It's an impressive marriage of aesthetics with technology, and would suit those who care more about aesthetics than raw specifications. It's not as good as the QLED or OLED TVs out there in terms of picture quality, though. You know how televisions always interfere with the aesthetics of your room? Well, Samsung does, and the company is doing something about it. Unveiled at CES 2017, the Samsung Frame was a concept television at the time. However, the company is actually selling it now. And though it caters to a very niche audience, it’s perhaps the only TV that audience will like. It aims to make the TV a part of your furniture, and it succeeds in doing that, in many ways. The Frame isn’t the perfect TV, but it’s probably the perfect marriage of aesthetics with technological prowess. As the name suggests, the Samsung Frame is meant to look like a picture frame. It has a thick, matte border running along the sides. Samsung allows the user to customise the frame, selling white, beige wood and walnut frames separately. You will have to buy the frame separately, or settle for the default black, matte finish frame. Personally, we’d pick the walnut frame though the default frame does justice to the concept as well. 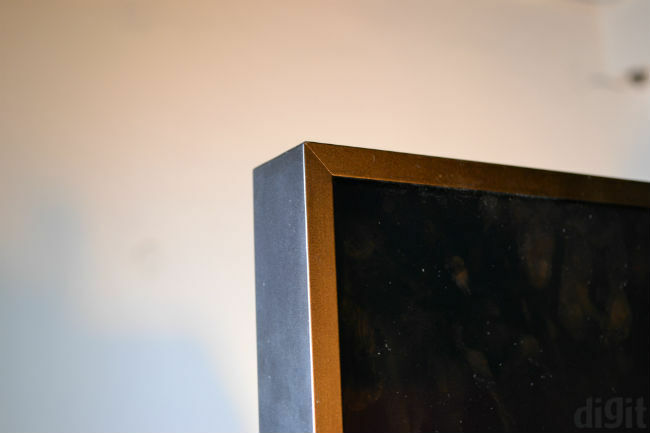 Its matte finish keeps light from reflecting off it, allowing the TV to be camouflaged when its in Art Mode. The frames can simply be slid onto the default one, making it easy to change them when needed. The company bundles the no-gap wall mount with the TV, which allows you to place it on the wall just like a picture frame. The no-gap wall mount does literally what the name suggests, eliminating almost all the space between the television and the wall behind it. Since Samsung uses the OneConnect box for ports, this seems like the ideal way to setup any television in any home. 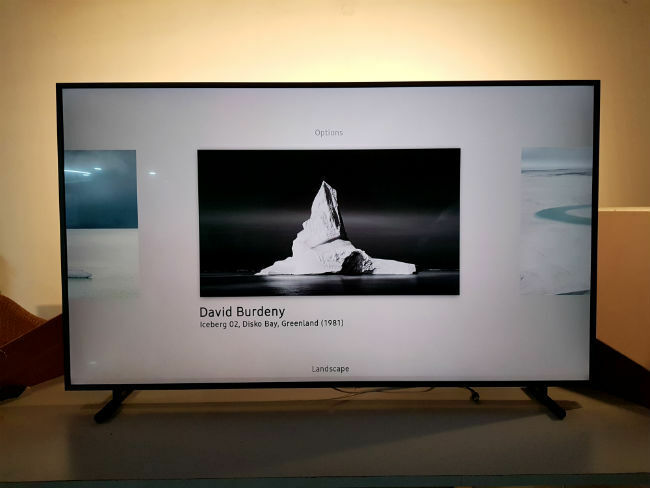 For those who have a lot of paintings and artwork in their home, Samsung wants to to camouflage this TV amongst them, making it a part of your home. Alternatively, if you want to set it up on a table, Samsung gives you the “basic stand” in the box. The company also sells a Studio Stand for this device, which at least to us, feels like the ideal way to use this TV. The studio stand resembles a easel, and really makes for a beautiful piece of furniture in your home. Even if you can’t spend on the Studio Stand, we’d recommend wall mounting this TV, because the Basic Stand is a dead giveaway that this is in fact not a piece of art. After all, how many people do you know who place paintings on a desk? Completing the concept is Samsung’s invisible cable, which runs from the bottom of the TV to the OneConnect box. 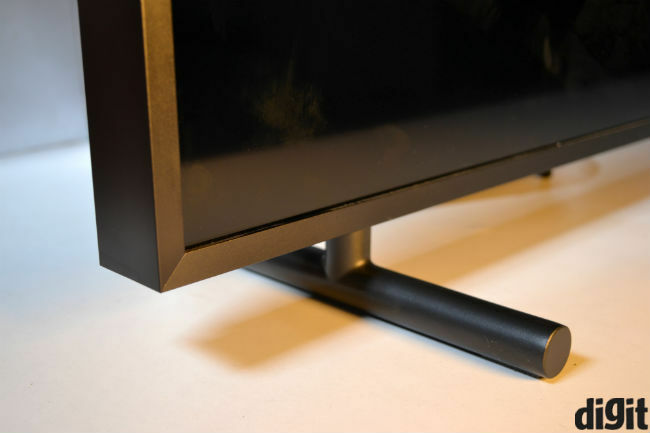 It’s a transparent cable, meant to be hidden in plain view, so that the TV doesn’t interfere with the rest of your furniture. And all this put together, the Samsung Frame is without a doubt the most beautiful television you will see. You could argue that it’s a thick mess, but that somehow adds to the aesthetics in our opinion. With the walnut or wooden frames, the thick border around the TV looks like a real frame, rather than a television frame. 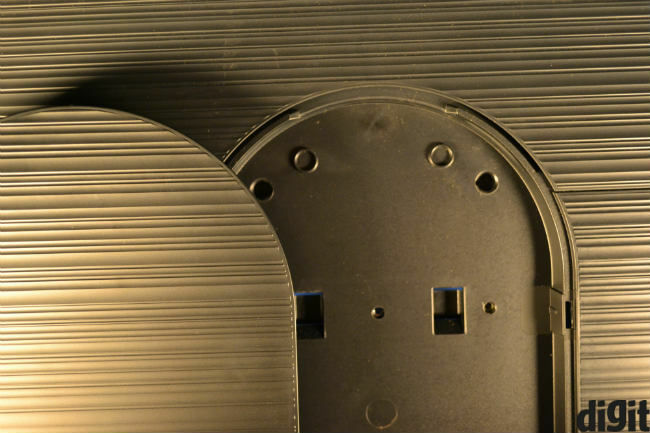 In fact, in a world where TVs are getting thinner, the thickness of this TV will actually throw many off. The Art Mode is what this TV is all about. You could think of this as the screensaver mode on Google’s Chromecast, except that Samsung uses much higher resolution images and from professionals. The TV comes with a host of artwork installed out of the box, and this is all catalogued by artist name. There an “Art Store”, which you can subscribe to for a starting price of Rs. 299 and keep building your library of artwork. You get the first month free here, but subscription charges start thereon. Samsung also allows you to put your own pictures onto the TV. For this, you use Samsung’s Smart View app. The app shows you all your downloaded artwork and photos on your phone, which can be synced to the television. It takes a few seconds each time you change photos, but the experience is quite seamless otherwise. You will need your phone and the TV to be on the same WiFi network. The only issue here is that the TV can’t automatically upscale your personal photos, so you will need to ensure that only high-res photos are used. Photos shot at 8MP and above should work fine, as long as they're taken using good cameras. There’s a tiny motion sensor on the bottom the the TV, which detects movement in the room. The Frame will shift to Art Mode whenever it detects an empty room for an extended period. You can of course shift the TV to Art Mode manually as well. It takes a moment to recognise movement, which shouldn’t matter to users. After all, you are meant to notice this TV, but not know that it is actually a full featured television. The TV also adapts the brightness to ambient conditions, so as to not stand out amidst other furniture. There’s a night mode that keeps it from interfering with your sleeping hours. As good as the Art Mode is, this is still a full-featured television. The Frame supports 4K video and has everything Samsung’s QLED TVs do. In terms of contrast ratio, our tests show similar results as the QLED TV from Samsung. At 50% brightness, the contrast ratio comes to around 6000:1 with no direct light falling on the display. That’s an excellent score for any television, though it’s still behind OLED televisions like the LG OLED C7 or the Sony Bravia A1. Of course, that doesn’t matter to Samsung and the niche consumer segment it’s targeting here. And overall picture quality is certainly amongst the better ones in today's market. You see the warmer tones that Samsung is known for and high resolution content looks great. The difference between this and Samsung’s QLED is primarily in brightness, while colour fidelity is slightly lower as well. For instance, the greens in Loki’s ensemble is slightly more punchy on the QLED, compared to the Frame. That said, the Frame still looks excellent and would suffice for most buyers. If you’re worried about screen burn-in, Samsung’s offering a 10-year warranty against it with this TV. That should convince even the most skeptical buyers. Samsung confirmed that this TV doesn’t have a QLED panel either. In terms of audio, Samsung focused on loudness over fidelity. The audio experience here is good, if loudness is what you care about. Dialogues don’t get muddled and the TV alone would suffice for larger rooms as well. However, it lacks depth in terms of bass response. The floor breaking beneath Loki’s body during his fight with Hulk (in the first Avengers movie) doesn’t sound very impactful, neither do explosions in Narcos and so on. Simply put, The Samsung Frame’s 40W audio output is enough for anyone who’s not an audiophile. 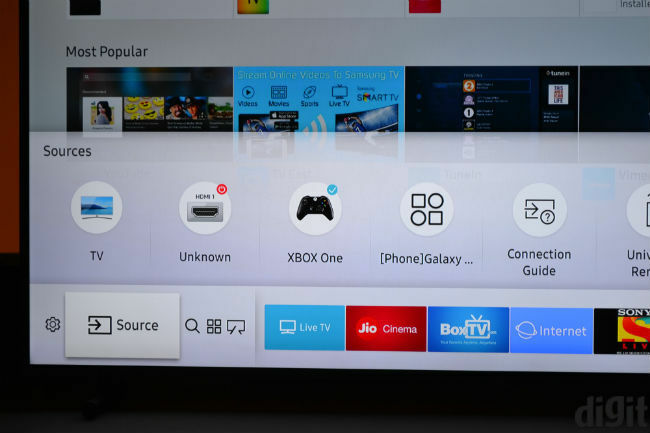 We’ve always been fans of Samsung’s software for smart TVs. Tizen is as fast and smooth as ever, with all the essential apps being available. That means you can download Netflix, Amazon Prime Video and more, though Hotstar hasn’t added support for Tizen yet. Regardless, Tizen and WebOS remain our favourites amongst TV software today. 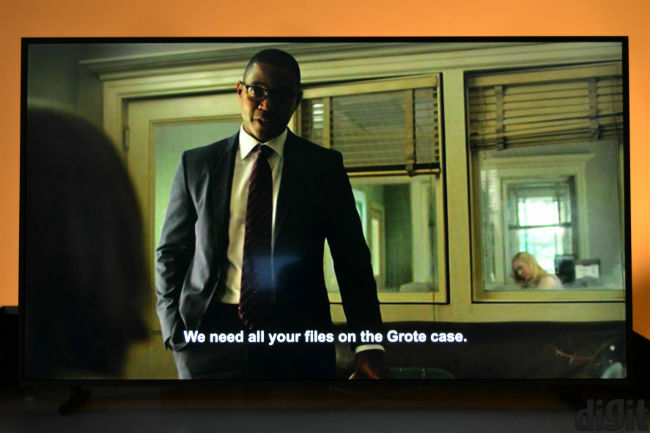 The Frame will recognise connected devices, like Xbox or a hard drive, and they will show up with those names, instead of showing the HDMI number. 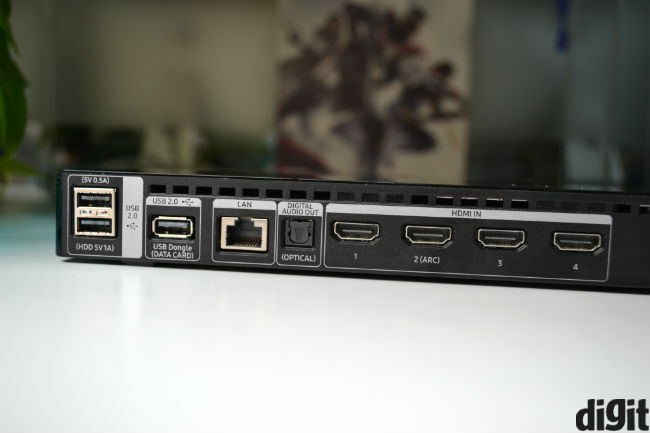 The OneConnect box houses four HDMI ports and three USB ports, which is plenty for most use cases. The box is the same as that on the QLED TV before this, so there’s nothing to complain here. The OneConnect box helps you hide cables effectively, and is an interesting solution from Samsung. 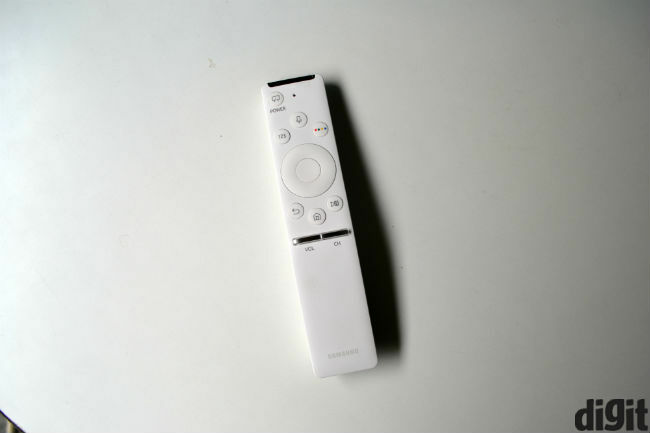 You also get the Samsung’s minimalistic remote with this TV. It’s called One Remote, because it allows you to control all connected devices with it. That’s an excellent solution for those who use various devices with their TVs. At a starting price of Rs. 2,74,900, there’s really no point in recommending this television to a regular consumer. That’s not because it’s a poor TV, but because it caters to a very niche audience. 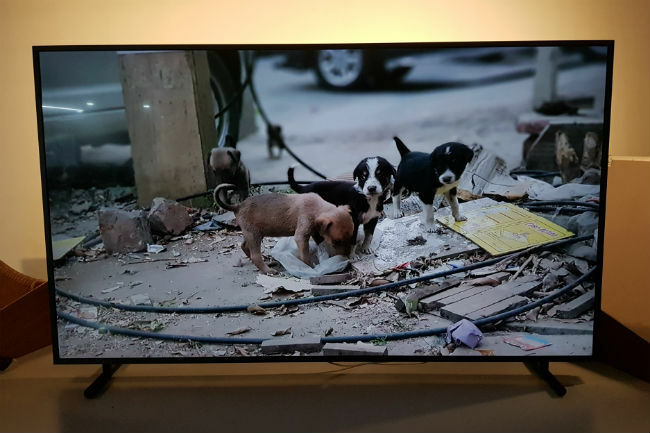 In fact, while these prices anyway narrow down the scope of such televisions, with its Art Mode, Samsung is targeting a whole other buyer here. The Samsung Frame will appeal to those who firstly have this kind of money, and secondly, are going to actually put effort into decorating their house tastefully. Are you one of them? 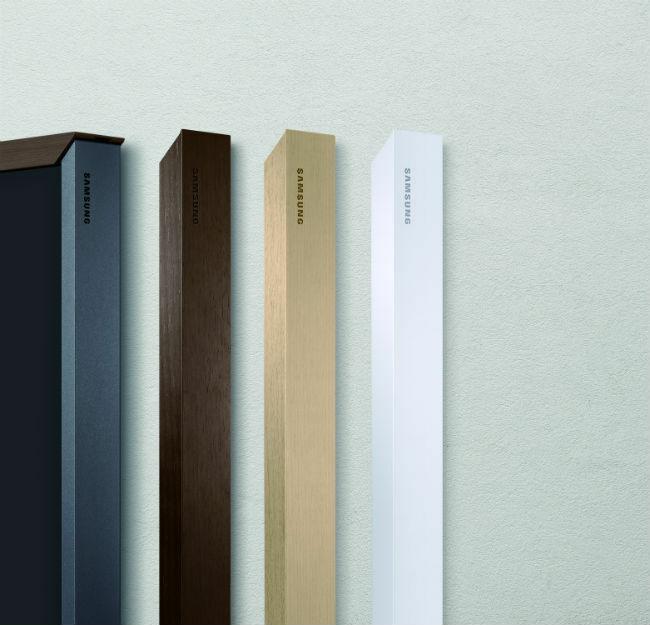 If you’re hiring an interior decorator to design your home for you, you should certainly check out the Samsung Frame. It’s a beautiful TV indeed, and though it obviously focuses on the Art Mode, the TV side of things isn’t shoddy either. If you can’t find a TV that looks good, this is the one you should pick.